Most frequently asked question: Where can I learn to do all that stuff? If you don’t care about my discourse on how various simulations of pre-modern sword combat work or don’t work, skip down to the bold type. This blog article will endeavor to provide you with a spectrum of answers. In the process, I plan to say some things which I view as obvious, but I’m going to guess that others will find them controversial. This question needs to be broken down. And in this blog, I will give an answer; several answers. But I want to look at the question. In the picture above, I’m wearing a pretty damn good late 14th c. harness. So is my opponent. And we’re in pretty accurate lists; that is, the size and style of the fighting space is period correct; and we’re using steel-headed but rebated spears (lanzia) which is a correct, late fourteenth century chivalric fighting style. Oh, and we’re surrounded by a crowd of 14th c. reenactors watching us. We are also fighting in a period style; the Italian style known as Armizare. To me, this is pretty close to heaven (this is in Italy, BTW). This is a very different thing, although it may, at first glance, look similar. This is two fighters from the ‘Battle of Nations’ part of the continuum of martial sport. At first glance they look medieval, although a little examination will show that almost all their equipment is stylized and sporterized. (Look, for example, at the American’s sword and the size of the shields. I could go on.). But leaving equipment aside, the BOTNs style of combat forbids thrusting… the single most important aspect of foot combat in the later Middle Ages. No ‘cut’ with a single sword would even be noticeable to a fully armoured knight, so the entire exchange becomes ‘tag with swords’ that completely benefits really big, fast men, and where technique, especially the techniques we know real knights used, simply don’t work. No spears, no pikes, not thrusting points, no long sword. Do I sound shrill? Perhaps I’m just tired of having this held up to me as an example of medieval fighting. It is not, and in fact, it reinforces the trope I have to fight every day as an author; that knights were unskilled barbarians hacking at each other in a blood-frenzy. And don’t even get me started on the whole inclusion of pre-1945 nationalism and the lack of chivalry. These are two (randomly chosen) folks with long swords at a modern HEMA (Historical European Martial Arts) tournament. (I will not, for the moment, digress on how much I dislike this term) They wear armour of textile and plastic, and sometimes their swords are plastic or nylon. They wear entirely modern fencing equipment, fence or fight in modern sports facilities, and are watched by modern crowds. On the other hand, many (most?) of them practice hard to use at least some of the techniques taught by Medieval, Renaissance, and Baroque authors. They also include cross-cultural techniques (most of them) and some modern fencing techniques. This is modern Olympic fencing. These two fencers are fencing with epees, or the weapon vaguely based on a late 19th c. dueling weapon version of a martial art that is entirely a sport. Note, for example, how BOTH of them have hit, without making a parry or cover or block or what have you. I’ll keep the rest of my comments to myself. This is Kendo, a traditional Japanese martial art. Kendo is not as old as the Samurai tradition and many aspects of it are highly stylized, like Battle of Nations; are sporterized, like HEMA, and simplified so that training can be rigorous, as in modern Olympic fencing. Kendo can tell us a great deal about the various directions in which modern recreations of Medieval ‘European’ combat may go. Note. For me, Armizare is the ‘best’ of these and ‘Battle of Nations’ the ‘worst.’ But I’ve done, and enjoyed all of them. Armizare is very expensive; Battle of Nations has all by itself, created a massive infrastructure of armourers and kit bashers and puts together huge, really dramatic medieval events that are excellent. NO ONE IS WRONG. I love Kendo; I love Olympic style fencing; I love just crossing long swords with a friend in minimal equipment (although when you pile on the modern plastic armour I admit I loose interest). So, when a person asks me ‘How do I learn to fence?’ that’s a very different question from ‘where do I learn to fight like a knight?’ The whole art of chivalric fighting, from wrestling to jousting, was called, in Medieval Italy, ‘Armizare.’ The rest of this article is mostly concerned with learning Armizare. We will, for the sake of clarity, call the middle pastime, ‘HEMA’ and the lower pastime ‘Fencing.’ Kendo is a thing all its own and not for today. All of these are merely locations on a contiuum. More clarification. When I say they are locations on a continuum, that’s because it’s important for prospective students to know that ALL martial arts, bar none, whether Krav Maga or Tae Kwan Do or Iado or Armizare are simulations of combat. MMA is still a simulation. It can be ‘real’ inside the ring, but the ring itself is a limiting factor. Training is full of limiting factors, not least of which (I hope) is that you don’t want to injure your training partners. Also, as I keep saying here and elsewhere, all martial arts and even war itself are cultural artifacts. Fiji Islanders make war differently from 2016 US Marines, and they, in turn, make war differently from both Macedonian phalangites or French medieval knights. We tend to believe that’s because of technology; sure, maybe, but even the slightest acquaintance with either the American Revolution or the recent conflict in Afghanistan will show cultural ways of war that leave the contestants unable to communicate even about victory and defeat. So a Medieval Italian has more needs than the ‘mere’ defeat of an adversary…if he fights in public, he needs to demonstrate a whole lot of manly virtues in his contest, and there are elements to a public fight that, to an outside observer, might look more cooperative than competitive. This will be different from a marital art practiced in China or a modern MMA match or a brutal street fight with thugs in St. Petersburg or L.A.. Right? Have I beat this horse to death? Right. Back to the nice young and middle-aged people asking to learn to fence. Or fight like knights. All that was prologue. I felt it needed to be said because SO MANY people ask me. So, you want to learn to practice Armizare? Here’s my advice. If you live in a city or town with martial arts instruction, start with that. If someone teaches Italian medieval martial arts, I recommend you check into their credentials and then JOIN. (You can always ask me if something seems odd, but while there is snake oil in Amizare, there are also many GREAT clubs and instructors.) I will recommend, here, and often, the International Armizare Society as a resource. But if no one teaches Italian, there are many who teach the various German systems. Often, very often, this means a later system that is more like fencing and less like armoured combat. Some clubs use federschwerts and plastic armour; some use heavier swords. All part of the continuum. Nothing you learn there will be a waste of time. Then there may be no club or school teaching any Medieval fighting arts. To me, that’s not so bad. ANY INSTRUCTION in ANY MARTIAL ART will move you closer to understanding fighting in armour and being able to do it. Karate, Tae Kwan Do, Aikido, Jiu Jitsu, Kendo, Iado, just to name a few ‘Eastern’ martial arts, all teach completely valid skills; footwork, balance, unarmed strikes and grapples. Strikes and grapples and locks and throws are all part of fighting in armour; they are neither more nor less important than how you use your sword or lance or dagger or pole axe. In fact, as is brilliantly brought out in ‘Old School‘ by Ellis Amdur, the older Japanese traditions contained almost exactly the same material that the older, more military western traditions contained; nasty, ruthless moves for a quick kill on the battlefield or in a duel, with your thumb or with a dagger or with a big sword. And while no one Japanese art fully encapsulates all of the samurai tradition (read the book) all of the surviving arts have important pieces. And while we’re at it, the base of all good western swordsmanship remains Classic French foil. Yep, so says I. Foil is the classical ballet of the sword world, and those who play it, even for a year or so, will almost always dominate those who don’t. Because of all the fascinating little lessons it teaches. So if you can find a basic ‘fencing’ class, I’d say start there. Fencing and Aikido or jiu-jitsu? Fantastic. Buy some books and teach yourself. So here’s my recommended course of action for those who want to learn Armizare and live hundreds of miles from the nearest dojo or salle. Buy a copy of Guy Windsor’s book ‘The Swordsman’s Companion‘ or his more recent ‘Mastering the Art of Arms Vol.II the Long Sword.’ I prefer the former, maybe because it was MY first book on the art. The art has moved on, some say. Ya di da. It’s full of brilliant solo exercises, and if you learn them, you will grow into a decent swordsperson. Period. Find a pell. What is a pell? Mine is a wooden electric utility pole in my back alley. Some people have the luxury of having a real pell; a log sunk into the ground. Some use a rubber tire suspended from a rope. Some use the corner of a house. I don’t recommend that last. Basically, a pell is something you hit to practice. Get a sword. To me, you should start with a steel sword, but heck, friends, you can start with a broom handle, and if all you can afford is a wooden waster, more power to you. I do not recommend a feder as they are really for a late 16th c. sport and not for armizare, but this, too, is in the continuum; if that’s what you can get and can afford, get a feder. At the top of the pile, the best in North America, would like a sword that accurately depicts the weight and feel of a medieval long sword. I recommend the Albion or the Arms and Armor products, but if you live in Europe you have access to Pavel Moc and a spectrum of other suppliers. Now you should be set to train for the next couple of years. You don’t need a helmet, a gambeson, or gauntlets because, frankly, you should not be crossing swords with another living human being for some time. Start with exercises. Both Guy’s book and the IAS videos (available online for members) have simple exercises of footwork and simple blade work. You should practice every day. 10 minutes a day, 5 days a week is much better than an hour a week, especially as you learn footwork and various guard postures. And cuts and thrusts. Once you have a little footwork and some postures from the books/videos, you go out to the pell and start hitting it. For this, a good wooden waster is pretty ideal. You don’t have to hit it hard. Just hit it a lot. About ten thousand cuts later, you will have a set of good, fast cuts. I truly recommend learning to cut from ‘The Swordsman’s Companion’ or from Sean Hayes’ video on the IAS website, but here’s the amazing thing; if you just cut at that pell 10,000 times, unless you have severe issues in your stance, you will in fact develop a good cut. Merely be honest with yourself about speed and strength and posture and watch the videos from time to time, because as you learn more, you will see more, too. 5) Practice. In fact, even if you find some classes, remember that classes are only to teach you things; you need to practice them to learn. 6) Oversight. So, if you are going to be a ‘distance learner’ and learn on your own, I strongly recommend you develop a relationship with the nearest, best Armizare club. Shop around; you have time, because you are practicing on your own. But find someone you like even if you will only see them twice a year, in Warsaw or in London or in Chicago. Make the time and spend the money to go, even once a year; ACCEPT CRITICISM. You will teach yourself things incorrectly. It’s part of learning. Listen to what is said, concentrate hard, and go back to your pell with new understanding. 7) Equipment. Hey, all that armour and cool medieval clothing looks fantastic! But… it actually takes a year or two to even know what you want. DO NOT BUY ARMOUR until you have played with some from other people. I strongly recommend that no one should buy armour until they have spent a year of two as a squire, helping another armoured fighter in and out; learning about styles and makers. A good harness is never less than $2000. It will cost much more if you buy the wrong helmet and the wrong gauntlets. You can buy armour that hurts you; armour that changes your fighting style for the worse…. much of the armour made today is too bulky, too heavy, and intended to be worn with massive amounts of padding, for various reasons, none of which are authenticity or even safety. Take your time. learn the art. You won’t be safe and capable for a year or two, anyway. And finding a knight or senior man or woman at arms to whom to be a squire is a tried and true method of having both a mentor and an equipment tutor. And knights need the help. Really. 8) Recruit. It is really much easier for 2 people to learn the art than one; with two, you can try things out; my observation is also that with two people to snark at each other, the odds of getting something completely wrong go down somewhat. And eventually (not right away) you want to do pairs drills; later, with helmets and gauntlets, light sparring; later still, real sparring. Takes two. The Pell doesn’t hit back. One more thing… YOU CAN DO THIS. That’s not some random pat on the head from a life coach. In two years, with about $4000.00 and some serious work (between 10 minutes and an hour a day, plus some just plain exercise later on) you can come face me in the lists. You might even beat me; I’m old. But the thing is in Armizare, the honour is in the doing. Come and do it! By now, I have no doubt created a disturbance in the force. Feel free to ask my questions; I’ll try and answer them, especially if you ask them on my FB author page. Thankyou for this extremely detailed novice guide to the art of sword play, it is very much appreciated. I am fortunate enough to have local long sword lessons near me (Dublin,Ireland) but as to the accuracy of what they teach I cant comment. On your advice I will be investing in a copy of Guy Windsors book to aid in my development. 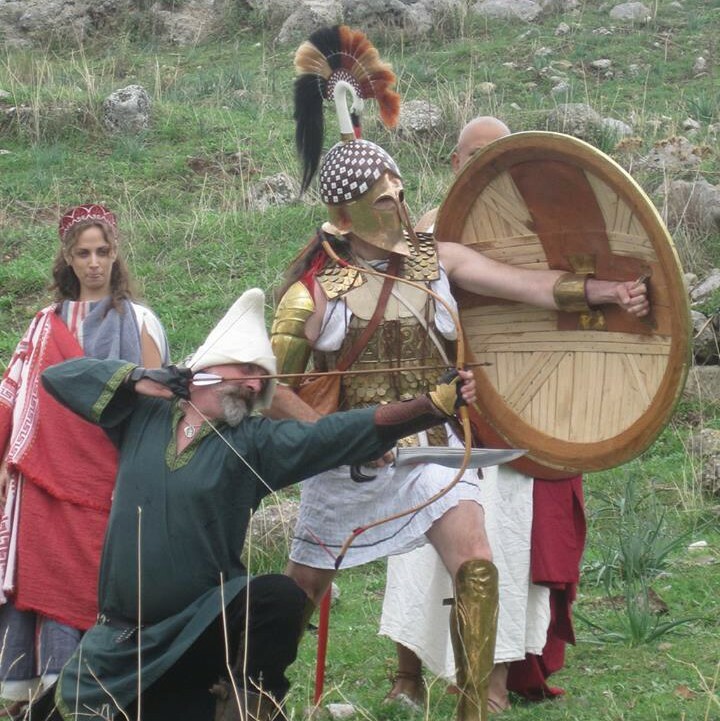 If I’m honest my first passion was for more of the classical spartan esq approach to sword and spear fighting but for this I found it hard to locate an instructor…could you offer any advice on this era of sword craft? The handful of people trying to reconstruct Classical Greek combat are scattered around the world and as far as I know they don’t get together often enough to have peer review (like Christian said, there are limits to what you can learn about someone’s approach from videos). I think Christian’s general advice is still valid: find someone who can teach you to fight with weapons, and start collecting books and articles like Barry Molloy ed., The Cutting Edge, the articles by Paul Wagner and Steven hand in Spada I and II, Die Angriffswaffen aus Olympia, and Christopher Matthew’s books and read them with an open but not credulous mind. Thanks for taking the time to sketch some of the different activities which make up the historical fencing world. I had been thinking of writing something similar, but got bogged down in wanting to be complete and realizing how many types of historically-inspired fun with swords there are today, and how hard it is to pin down the different subcultures even in a part of that world that you think you know. Plenty of people play in two or three different games. Christian: Why nothing on the SCA? Surely it is as important as the BoN construct? Like Kendo and reenacting, the SCA deserves an article to itslef. To me, SCA combat is another simulation, and its goods and others would fill an article. For example, I find SCA individual combat to lack some of the things I look for in Armizare, but SCA mass combat to be one of the finest ‘historical’ experiences available. And while I love the SCA, it’s not reenacting, and the frequency with which people have to tell me that this ‘is not reenacting’ keeps me from being as involved as I might otherwise be. And at this purely personal level, no one has ever flooded my FB feed with picturtes of SCA fighting and told me that this is what I do… Nor do SCA fighters constantly make wild claims about the ‘validity’ of their art; I think veteran SCA fighters are very secure in their prowess, if you take my meaning. Paul Porter (SCA: Paul of Bellatrix), back when stricter reenactment was just beginning to grow, quite securely admitted to me that he thought SCA fighting was a new creation and that was fine. He of course was perhaps the best practitioner of SCA combat and before that was a high-ranked judo or ju-jitsu practitioner. He’d had the opportunity and motivation to think long and hard about these issues. Along with accept criticism. .. I have shared those on a couple of my Facebook groups I run with credit to you..
All my best learning has come from the things I did wrong….